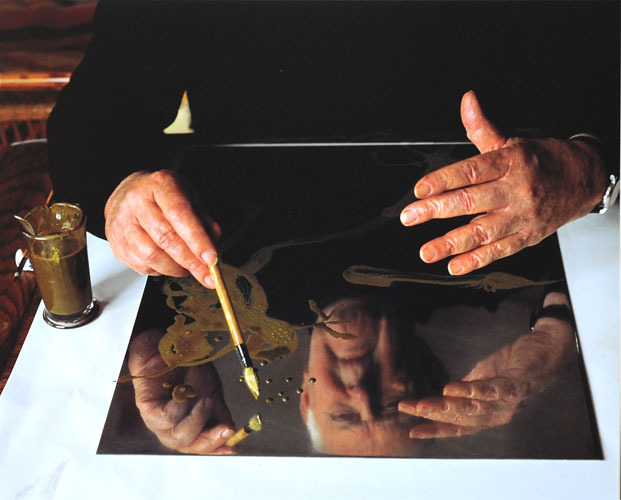 This is a photograph of John Olsen working on a plate, john is experimenting with a sugar lift solution in preparation for his new fine art work. John Olsen has since the 1970s sold almost 2300 works of art in the Australian auction market alone, in 2009 to date there has been 139 sold. John Olsen a good friend and admirer of Garry Shead and his fine art had recently attended Garry’s November exhibition tilted “Love on the Mount Pleasant Garry Shead toasts Maurice O Shea” held at the Orange Regional Gallery New South Wales managed by Alan Sisley. At the exhibition John Olsen was taken with a particular original Garry Shead piece titled “Mount Pleasant Summer, 2009”, It was purchased by John Olsen personally and then kindly donated to the Orange Regional Gallery as a gift for the love of great art and the Australian Public to see for ever. The Gallery Director Mr Alan Sisly and the community were very taken as to the kind generosity of John Olsen. The opening night was a great success and the exhibition was brilliant, there where some very nice people in attendance, John Olsen in particular, of course Garry Shead and many other surprisingly well known people sneaking out of the city for a great Garry Shead exhibition in Orange a beautiful town and full of history, most of all it was very well supported by the local community which was the most rewarding and important thing, a good time was had by all. John Olsen Australian Iconic artist, supports the Australian Art world and Australian Artists, his inspirational poetry can be seen is much of his original oil paintings, etchings and limited edition fine art. Etching House are Specialists in John Olsen original paintings, water colours, etchings and reproduction fine art prints. John Olsen fine art available at Etching House.